Monarch Crafts, Jaipur (Pink City, India) based company, backed by the people with decades of experience. 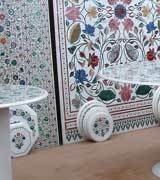 Company's principal activities are to manufacture and export inlay products which include Table Tops, Flooring, Tiles, Stairs, Borders and Panels. We claim the trust, respect and amity relationship of the domestic market and upholds these with international relations. We are respectful to the handicraft sector. It does not only make business for company but also for the sector's benefits. We are respectful to the environment. We never hurts environment while working. Our brand name is quality. we never make concessions over total quality.